It began with Bye Bye Birdie and Gidget just made it worse- my Keds obsession that is. The scene below from Bye Bye Birdie (the 1963 version) started me thinking I needed to inject more colour into my shoes. Watching Sally Field's Gidget match various coloured trainers (with contrasting white laces) to her wardrobe encouraged me to research this 60s trend. 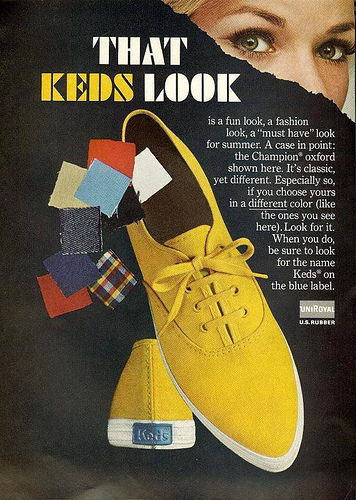 It seems to me that Keds were the trainer of choice in the 1960s (at least in America). They were available in a variety of colours and patterns. I don't recall the brand as a child so I'm not sure exactly how long they've been available in other countries but I know I can buy them in England now. The first I ever heard of Keds was in the movie, Stand By Me - "The train had knocked Ray Brower out of his Keds the same way it hadknocked the life out of his body". Audrey Hepburn was said to have made them fashionable after wearing them in the movie, Two for the Road but they have been available since 1916. I have been watching a lot of Gidget lately and am becoming strongly influenced by her cute style. She seems to have a different colour for each outfit although her favourites would probably be these red ones. 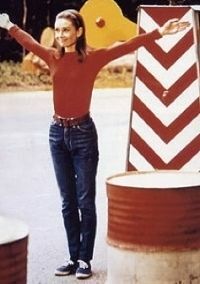 Although it was very hard to get this snapshot, Gidget's red trainers really stood out to me. Gidget's friend LaRue also wears them (with a very similar outfit). Since I've only just recently bought a pair of red Converse, I've decided upon a yellow pair for my very first Keds (you can probably tell I don't wear heels much). I'm not sure I can stop at just one pair - I'm already sure I need a pair of white ones too! Keds are an obsession for me. Been wearing them for twenty years. At one point, I owned 9 different colors, in oxfords and maryjanes. And now, I have two pair of ked oxfords, and one wedge pair made last in '09. There was a Keds resurgence in the late 80's when I was in elementary school. 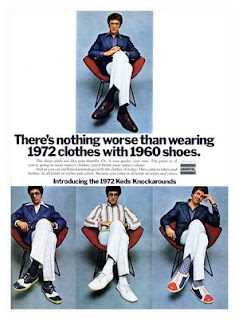 This prompted a lot of knockoffs, which I hated wearing. I always wanted real Keds but we couldn't afford it. And you could always spot the difference because of the blue label. I finally got one navy pair one year and wore them until they completely fell apart! 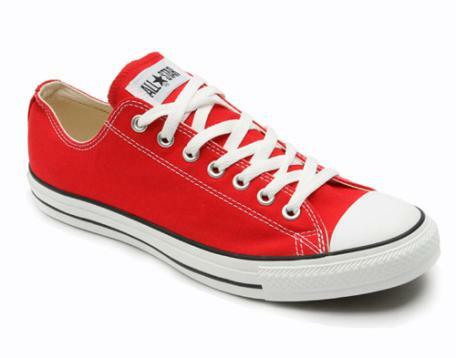 Then I switched to Chucks, now I prefer the Jack Purcell. 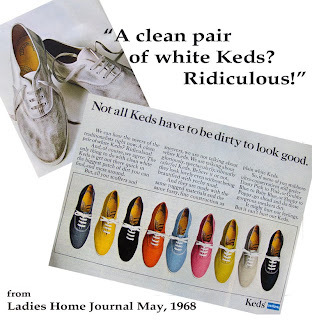 You know, I've never had a pair of Keds...knockoffs, yes. Are the real ones comfortable and can you wear them without socks and not get sweaty feet? :-D My feet hurt all the time, but I always wear cheap shoes, and I'm wondering if it's time for a change! So let's hear your review! Hi, Anon here. I've never worn the knockoffs, so I don't know what the comfort level of those are. 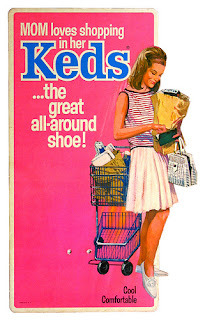 I find the actual Keds wonderfully comfortable, and can wear them all day while shopping, gardening, housework, etc. I have worn mine without socks, and you do risk getting sweaty feet, depending on how hot it is. I have noticed with the two pair of oxfords (called champion by Keds) is there is a fit difference. One is the navy color, and they fit nice and snug, no looseness. The other pair I have is stone in color, and find they are looser in fit, though the same tag size as the navy. Depending on how you like your shoes to fit (I prefer snug, it feels more secure to me) you may need to try a different size. Wow Anon, quite a comprehensive review there - thanks! As soon as I get my pair (and wear them) I'll post my own review. Thanks for sharing some 60's style with us. That case my hubby will need some too!!! Hope you had an excellent trip OS. Keds rock! Love your red "Chucks" as we fondly call them, and the yellow Keds are such a great color. I need to buy another pair of Keds. I had a pair of (no surprise here) kelly green ones that I wore until they faded, and I gave them away a couple of years ago. White is the classic, perfect with a french sailor's shirt in white and navy with cuffed dark jeans.